Last night, my partner Rod felt a migraine coming on. I had been talking to one of my business coaches on the Saturday before about his repeated migraines. She is a Naturopath, so I took her advice. I gave him 2 Cyactiv capsules and another 2 opened in water. His migraine went away without any other effort. “This is something I have used with a few people now at the onset of a migraine.” explained the Naturopath who advised her. 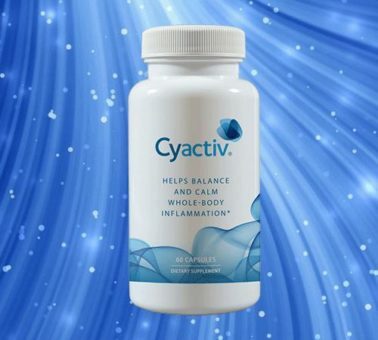 Cyactiv ® is a proprietary phycocyanin extract from Spirulina. Phycocyanin is the blue pigment in blue-green algae and is a potent active compound proven to help balance and calm systemic inflammation associated with a myriad of health issues. Balancing whole-body inflammation assists the homing of stem cells to affected tissues. Cyactiv ® Contains Spirulina Extract (Phycocyanin >30%) 1000 mg and can be ordered here. A study recently published in the Journal of Medicinal Food (Jensen et al.) set out to show how Cyactiv works in the body. It contains a known anti-inflammatory cyclooxygenase-2 (COX-2) inhibitor phycocyanin (PC), as well as a high level of non-phycocyanin bioactive compounds. A number of the observed effects were attributed to the phycocyanin component of Cyactiv. The results also indicate that the non-phycocyanin components were just as important to Cyactiv’s efficacy. The conclusions of the study imply that the natural synergy of the phycocyanin and non-phycocyanin components of the bright blue spirulina extract contained in the capsules provide superior nutritional support against long-term inflammatory conditions. It has been stated that Cyactiv is an effective natural anti-inflammatory without the known side effects of nonsteroidal anti-inflammatory drugs, as well as having significant benefits as an antioxidant. Cyactiv® is NOT designed to cure, treat or diagnose migraines or any other disease or condition. The research behind it shows it is effective in calming and balancing whole body inflammation. This is an interesting use of Cyactiv®. If you would like to try it you can order it from the link on this page or you can join and receive a discount. The product is sold with a 30-day guarantee, so if you don’t get benefit from consuming it you can send the bottle back and get a refund on the product price. Best results are achieved by consuming it daily in with the other 2 products in our range for at least three months.